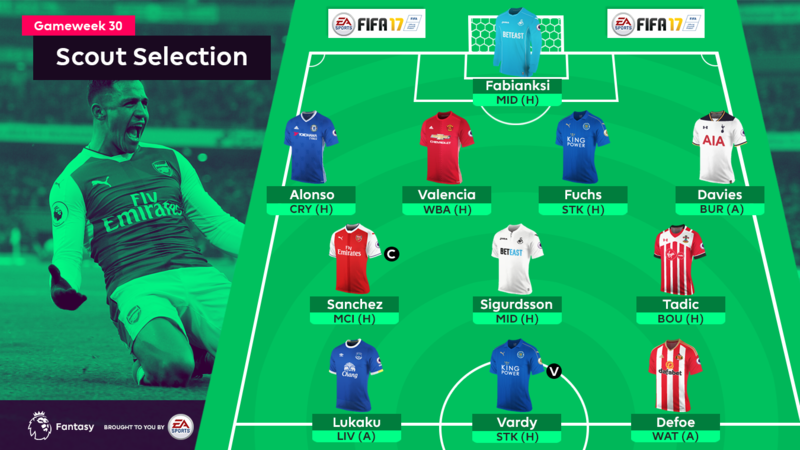 With our selection producing 92 points prior to the international break, the Gameweek 30 XI has a high bar to reach. 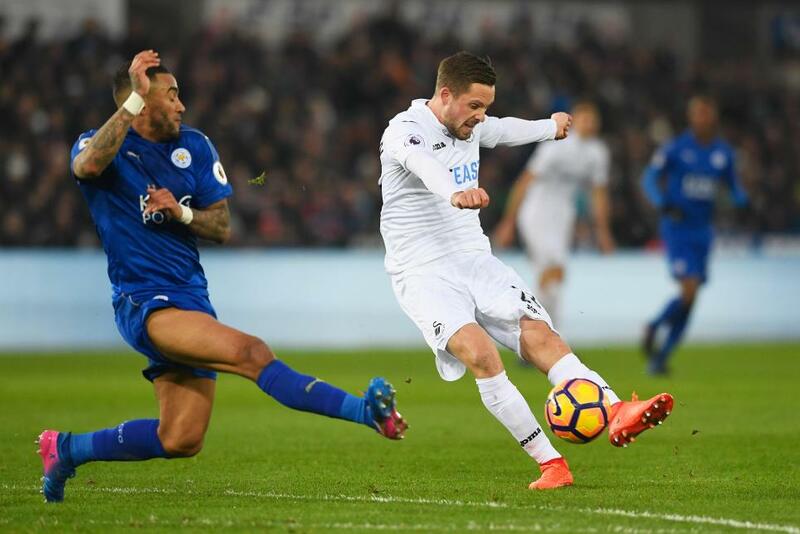 Two sides enjoying recent revivals supply the core of the line-up, as Paul Clement's Swansea City and Craig Shakespeare's Leicester City contribute potential in attack and at the back. The Swans keeper makes the cut mainly due to the struggles of opponents Middlesbrough. Steve Agnew's side arrive at the Liberty Stadium having scored just 20 goals from 28 matches. Their average of 2.4 shots on target per match is also the lowest in the Premier League, underlining Fabianski’s potential for a fifth clean sheet. While the 15.6%-owned Spaniard has failed to return a clean sheet over his last six Gameweeks, Alonso still boasts the most shots (33) and touches in the opposition box (58) of any FPL defender since his Chelsea debut in Gameweek 6. The Welshman retains his place having flourished at left wing-back for Spurs in Danny Rose's (£5.9m) absence. Only Christian Eriksen (£8.7m) has created more chances and supplied more successful crosses for Spurs than Davies since he claimed a starting role in Gameweek 24. The top transfer target with more than 124,000 new owners since the previous deadline, the right-back has produced a goal, an assist or clean sheet in six of his last seven Gameweeks. His opponents West Bromwich Albion are likely to rotate following international exertions and have failed to score in 11 of the last 15 meetings against United in all competitions. The Foxes are increasingly reliant on the threat from Fuchs working in tandem with left-winger Marc Albrighton (£4.9m): 44% of their chances created under Craig Shakespeare have arrived from that pair. The Austrian's forays forward will be key against Stoke City, a fixture which also promises a first Leicester clean sheet since Gameweek 20. Shaking off an injury scare to sparkle for Chile over the break, the top-scoring FPL asset will face Manchester City at the Emirates Stadium having produced a goal or an assist in eight of his last nine Gameweeks. That consistency ensures that, after much deliberation, Sanchez claims the captaincy. The Icelander was himself a strong contender for the armband having also shown an unerring run of FPL returns. Only Sunderland's Jermain Defoe (£7.8m) has been involved in a higher proportion of his side’s goals than Sigurdsson this season, who has produced an assist in four of the last five Gameweeks. Ranked top for chances created (46) and second for shots on goal (44) in the Saints' camp, Tadic has been in outstanding form since being deployed in the No 10 role. With three assists and a goal in his last four Gameweeks, he also produced a goal and two assists for Serbia over the break to highlight his threat to south-coast rivals AFC Bournemouth ahead of the St Mary's encounter. With four goals in his last five appearances in all competitions, the Foxes striker is back replicating the kind of form that produced 24 goals, eight assists and 211 FPL points last term. Vardy ran Sanchez close for our armband. While the Belgian faces the cauldron of a Merseyside derby at Anfield, his form is strong enough to maintain a run of appearances in our XI. Lukaku has scored in his last four Premier League outings, with nine goals and two assists over the last six Gameweeks. Meanwhile, Liverpool have conceded 36 goals, more than any other side in the current top seven. Buoyed by a scoring return with England in the win over Lithuania, the Black Cats striker is also back in our selection, despite notching in just one of his previous seven Gameweeks. In a vital Vicarage Road visit, Defoe will be the major threat to a Watford defence with just a single clean sheet since Gameweek 10.